This tutorial explains how to install Zekr on 18.04 and configure a good font for it. You will need to download the Zekr program itself, install Java on your system then, and finally install Zekr correctly. And, I suggest you here to use Amiri Quran font with Zekr because I find it's the best for now. Don't worry, although Zekr is not present anymore in the Bionic repository, we still can install it manually by these instructions. Have a good reading! Previously, we can perform sudo apt-get install zekr in any Ubuntu version before the 18.04. But on this 18.04, we cannot do it anymore, because Zekr has been removed from the repository. The last version to have Zekr was 17.10, a version before 18.04. So this article takes it place for you, this explains how you Ubuntu 18.04 user can install Zekr in easy way + have a very good Arabic font to display the Quran. To install Zekr, see next section. 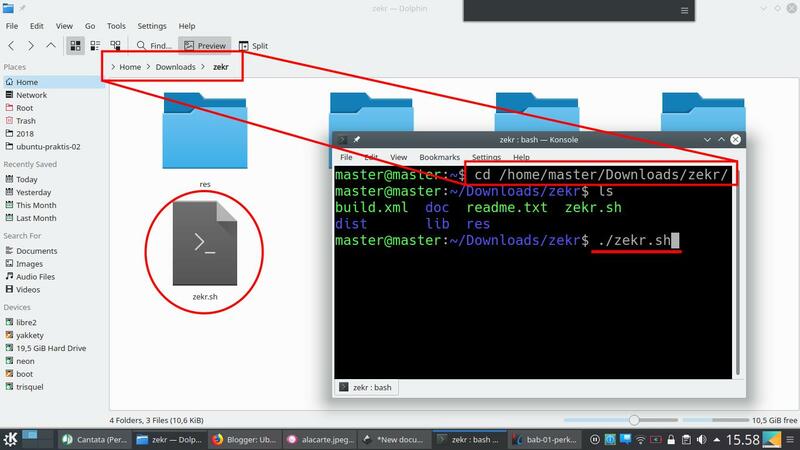 Before reading the installation section, you may see how easy to put the manually installed Zekr into your desktop menu. 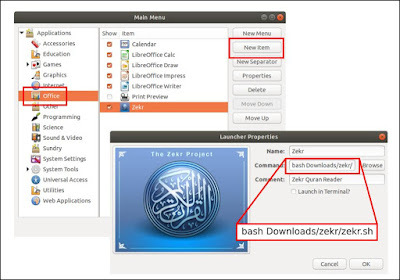 1) For Ubuntu (GNOME): use Alacarte Menu Editor*: select a section from the right panel > press New Item > type the name Zekr and the description Zekr Quran Reader and the command** bash Downloads/zekr/zekr.sh > press OK button. Now look up your Ubuntu menu and Zekr should be there. 2) For Kubuntu: this one is easier: right-click on the menu logo > Edit Applications > KDE Menu Editor window appears > select a section from the right panel > press New Item button > type the name Zekr and the description Zekr Quran Reader and the command bash ~/Downloads/zekr/zekr.sh > press Save button. After doing these, see your Kubuntu menu and Zekr should be there. 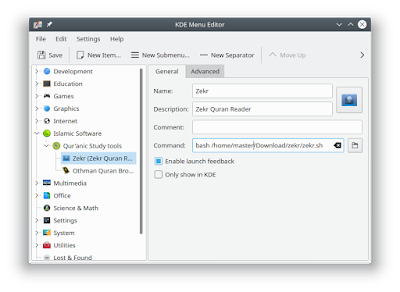 **) Different to KDE Menu Editor, Alacarte does not accept '~' (tilde) sign so you need to type the folder address instead. Note: if you find any newer version, download the newer version instead of these. By finishing these 5 steps you have successfully installed Zekr. I recommend you to use Amiri Quran (or anything from Amiri Font) 23 pt although you find Zekr's website recommends me_quran and another website recommends KFGQPC Uthman Taha Naskh. Amiri is a free (libre) font licensed under Open Font License from Amiri Project. Thanks to brother Khaled Hosny for creating this really awesome font (may Allah bless you, Brother). However, Kubuntu users do not need to download it anymore because it has been preinstalled on Kubuntu 18.04. 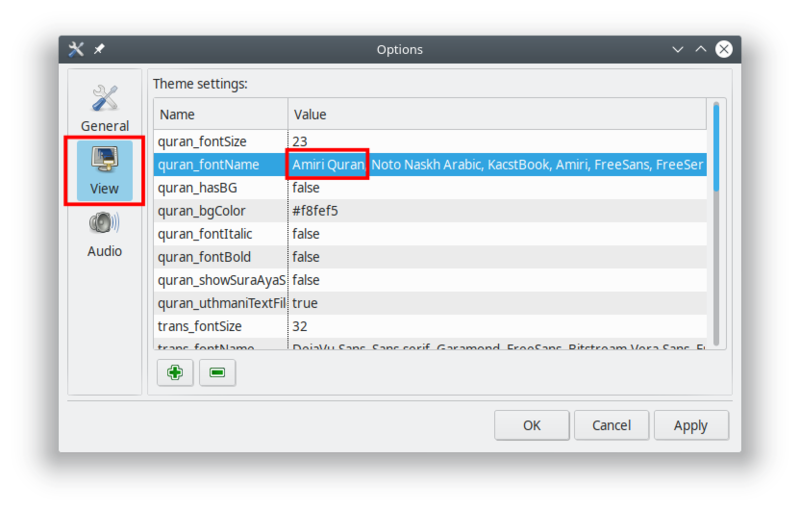 On the Zekr window, go to menu Tools > Options > View > select the quran_fontName variable > press Space bar > type the name of the font "Amiri Quran" anyway, separated with a comma > press Apply > press OK > right-click on the sura > Reload.